The Maruti Suzuki Ertiga has been the unquestionable leader in the budget MPV segment in India. However, the launch of the Mahindra Marazzo has rightfully stirred things up. Though the Marazzo stans in a segment above the Ertiga, you do get a considerably bigger seven-seater and a largers road presence an that too for a considerable price increase. 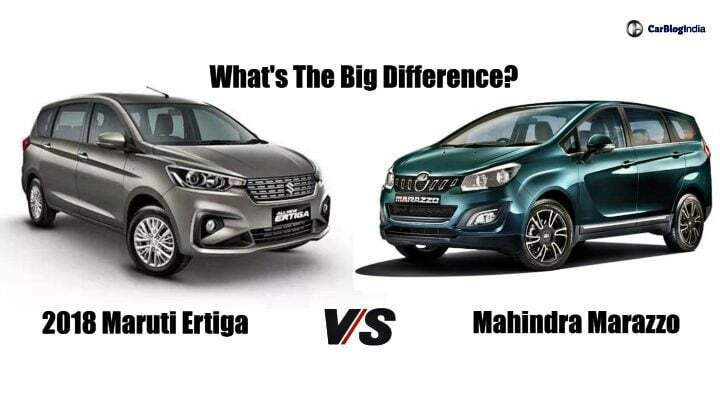 In this detailed specification based comparison report, we compae the Maruti Suzuki Ertiga against the Mahinra Marazzo in order to see which one out of these two tuns out to be the better choice for you. Read along! The older generation of the Maruti Suzuki Ertiga fell in between the price range of INR 6.16 lakhs and INR 10.45 lakhs. With added features and a new platform, we were expecting the prices of the Ertiga to increase slightly. And expected, the base variant of the Ertiga now retails at a price of INR 7.44 lakhs. On the other hand, the top-end variant is going to cost INR 10.90 lakh. Coming to the Mahindra Marazzo, as of now, this MPV is only available with a diesel engine. Based on a ladder frame chassis, its base variant costs INR 9.99 lakhs to own. On the other hand, the top-spec trim of the MPV retails at a price of INR 13.90 lakhs. With this second generation update, the Maruti Ertiga is going to come with an all-new petrol engine. This is the same 1.5-litre, 4-cylinder, K15B unit which made its debut in India with the new Ciaz. This gasoline driven engine is capable of producing 105 BHP of power along with 138 Nm of peak torque. This engine comes as standard with a 5-speed manual gearbox. There will be a 4-speed torque converter unit also on offer. Not only this, but we are expecting Maruti to pair this engine with Suzuki SHVS mild-hybrid technology as standard. Increasing the fuel efficiency of the engine significantly. Also Read: New 2018 Maruti Ertiga Vs Old Ertiga- What’s The Difference? Talking about the diesel engine of the Ertiga, it continues to retail with the same 1.3-litre, DDiS unit. This engine is capable of producing 88 BHP along with 200 Nm of peak torque. As standard, it is going to come with a 5-speed manual gearbox with no automatic on offer. Just like before, it will continue to come with Suzuki’s SHVS technology as standard. As mentioned before, as for now, the Mahindra Marazzo is only available with a diesel engine at its disposal. This engine is a 1.5-litre unit and is capable of producing 120 BHP along with 300 Nm of peak torque. As standard, it comes with a 6-speed manual transmission. Mahindra has confirmed that it is going to launch a petrol derivative for the Marazzo as well. And along with that an automatic gearbox for this MPV as well. The petrol engine is going to be BS-VI complaint. The petrol engine is the Maruti Ertiga is likely to offer quite decent mileage numbers thanks to the new SHVS mild-hybrid system. Expect it to offer a fuel-efficiency figure of more than 19 km/l. The diesel derivative, against curtsey of the SHVS system, will promise a fuel efficiency figure of around 25 km/l. Coming to the Mahindra Marazzo, its 1.5-litre diesel engine 16 km/l of mileage figure in city driving conditions. Whereas, out on the highway, the figure stands around 20 km/l. As mentioned before, the next-generation Ertiga is based on Suzuki’s new HEARTECT platform. This means that in comparison to the older generation model, this MPV has now bigger, wider and more spacious than before. Coming to its dimensions, it is going to measure 4,395 mm in length, 1,735 mm in width and 1,690 mm in height. It will have a wheelbase stretching at 2,740 mm. Ground clearance is expected to be in-between 170 mm to 180 mm. Boot space is going to rank around 200-liters mark. Moving on to the Mahindra Marazzo, this premium MPV measures 4,585 mm in length, 1,866 mm in width and 1,774 mm in height. It clocks a wheelbase of 2,760 mm. The boot capacity stands at 190-liters with all the three rows intact. With the launch of the 2018 Ertiga, Maruti Suzuki has considerably increased the equipment list of this MPV. The current generation iteration of the Ertiga now comes with several safety features as standard. In comparison, the Mahindra Marazzo comes with the following safety features.